Our 1st Statewide READ begins on Tuesday, September. 8, 2015, which is International Literacy Day. Many of our member agencies already plan to participate with the volunteer tutors and adult learners working together in their literacy programs. Wisconsin Literacy's Statewide READ will kick off in conjunction with our 1200 Tutors in 12 Weeks campaign on Sept. 8. We envision book clubs, libraries, literacy agencies, and any other interested groups of people reading the book, Hot Dogs and Hamburgers: Unlocking Life's Potential by Inspiring Literacy at Any Age, by Rob Shindler, during September and even into November, and then sharing their thoughts and ideas. We put together a Toolkit to help our member agencies use this Statewide READ as a way to recruit new tutors and volunteers for their literacy programs. The Toolkit also contains a discussion guide that can be used by book clubs as well as a Reader's Guide that can be used by tutors and learners who might want to use the book for their reading lessons. The Reader's Guide includes vocabulary lists and comprehension questions as well as a press release template for promotion. We invite you to join in the Statewide READ at any time during the campaign. through their Summer Reads program. 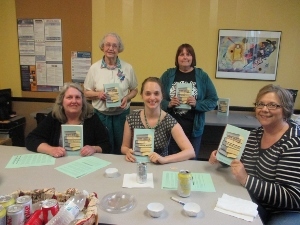 Jefferson County Literacy Council's book club held a session to discuss Hot Dogs and Hamburgers: Unlocking Life's Potential by Inspiring Literacy at Any Age.